Thank you all so much, again, for hanging in for all the guest posts! I promise by July we'll be back to 100% me all the time-seriously though, I feel like I may be a disappointment after all the awesome bloggers I've had swooping in to help me out. Like today's! Jennie is back! One of my best bloggy buds-Jennie (AKA The Messy Baker)'s photography skills are amazinggg, her food is delicious, and she's also genuinely a gal that I would be-and am-friends with! My current obsession is trying to convince her and her hubby (affectionately referred to on her blog as "Squirrel") to move to the Cleveland area. (JENNIEMOVETOCLEVELAND). I'm super subtle about it, though. Hello again, Cooking Actress fans! I’m here to fill in while Kayle settles into her new home in Ohio and adjusts to life in the country. Well, it’s the country in comparison to New York. My name is Jennie. I’m gal who makes a mess over at The Messy Baker. This isn’t my first rodeo at The Cooking Actress. I wrote a guest post back in October for Kayle while she was celebrating a relative’s wedding. Being the cookie queen that Kayle is, I made a batch of Pumpkin Cheesecake Cookies. I decided to go a different route this time and make a breakfast item. 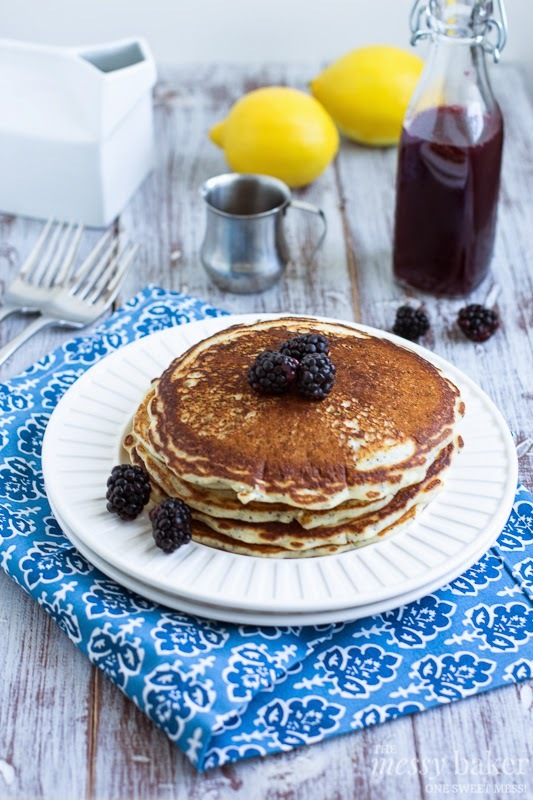 How does Lemon Poppy Seed Pancakes sound? Like breakfast to your ears, right? I don’t know about you, but I can manhandle a stack of pancakes with no problem. 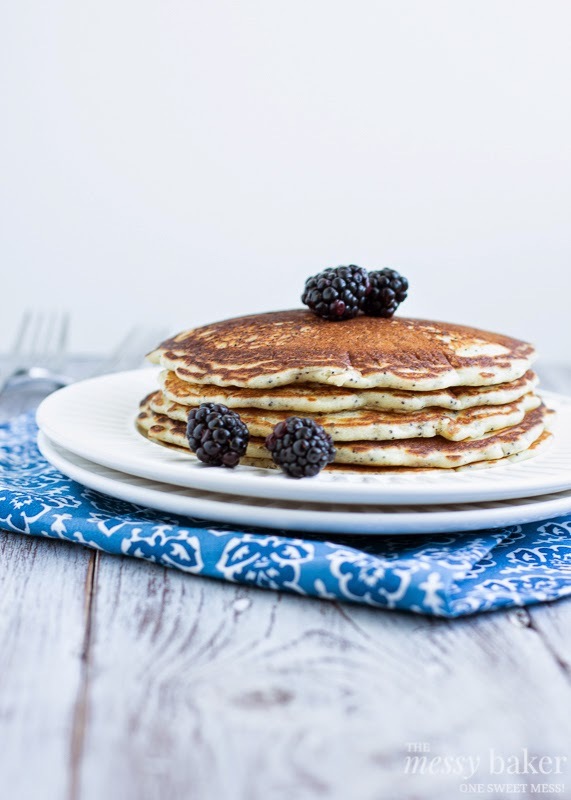 I don’t make them very often because Squirrel poo-poos them (the weirdo), so when I get my hands on a plate of hotcakes, you bet I’m going to go a bit overboard. I like my pancakes crisp on the outside and fluffy on the inside. The secret to crisp edges is adding a little canola oil to the bottom of a non-stick pan. Once the canola oil is hot, you’ll ladle in a scoop of pancake batter. I cook my pancakes until I see bubbles form, then I give ‘em a flip and cook the other side for 30 seconds to a minute. We can’t have a stack of pancakes without syrup, am I right? I prefer all-natural maple syrup. Call me a syrup snob, but there’s no way maple-flavored corn syrup is even going to look in my stack o’ cake’s direction. Today I decided to raise the bar and make homemade blackberry maple syrup to drown our pancakes in. Lemon and blackberries just make sense. 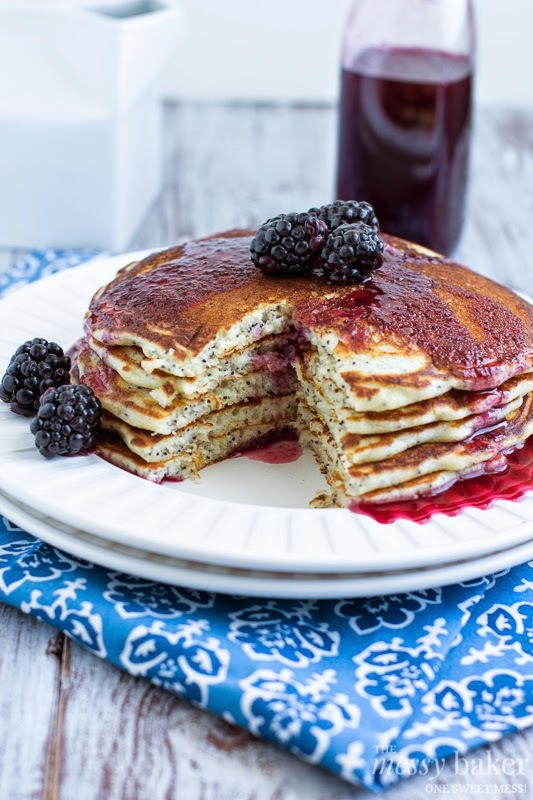 The blackberry maple syrup comes together in under 10 minutes. Add 7 ounces of fresh blackberries to a saucepan. Add ½ cup of pure maple syrup, ¼ cup water, and 2 teaspoons cornstarch. Whisk to combine. Bring the mixture to a simmer over medium-low heat. Mash the berries using a fork or potato masher, and then bring the mixture to a gentle boil, allowing the cornstarch to thicken the mixture. Once the mixture thickens, take it off the heat and allow the mixture to come to room temperature. Strain the syrup through a mesh sieve and store in the refrigerator until you’re ready to serve. Heat in the microwave for 30 seconds before drizzling over your hotcakes. 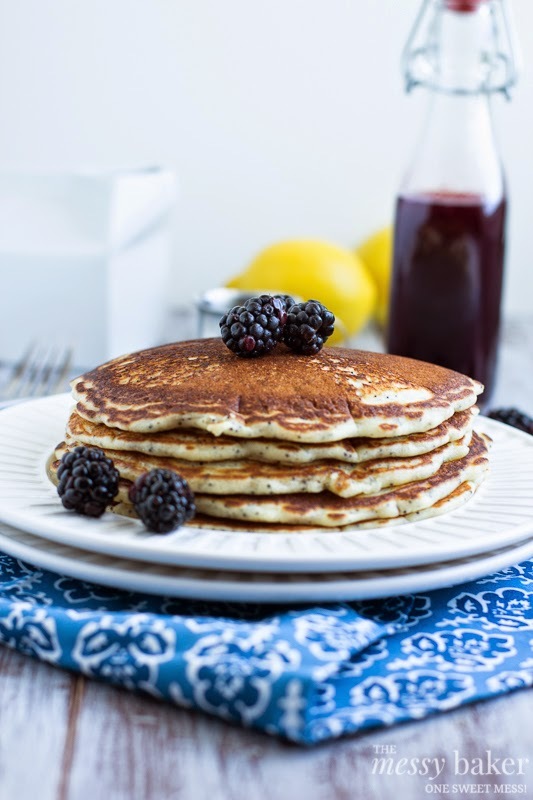 The pancakes are perfectly crisp on the outside and fluffy on the inside. The combination of lemon and poppy seeds is a classic combination that’s sure to impress. 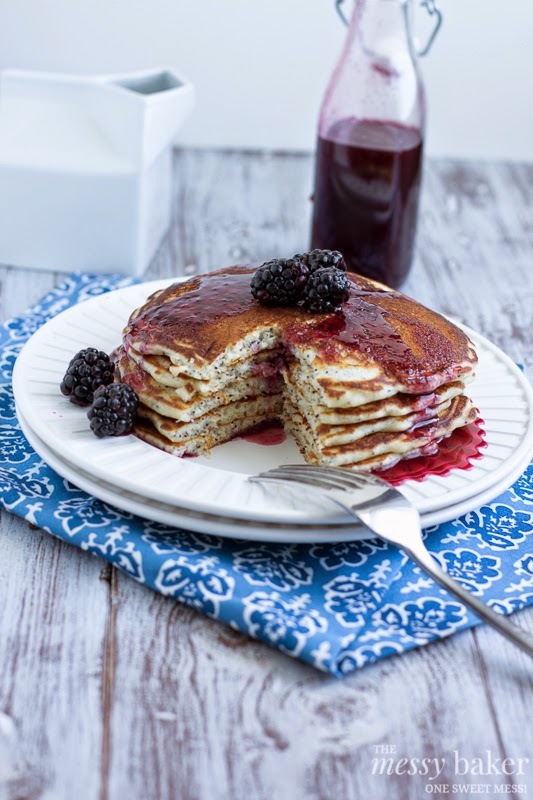 Drizzled with homemade blackberry maple syrup, and these hotcakes are irresistible. In a large bowl, whisk together flour, baking powder, salt, sugar, and lemon zest. Set aside. In a small bowl, whisk together melted butter, lemon juice, and poppy seeds. Add the milk, egg, and vanilla. Whisk the mixture to combine. Whisk the wet ingredients into the dry ingredients until the mixture is smooth (a few lumps are okay). Heat a nonstick skillet or griddle over medium-low heat. Add a swirl of canola oil. Once the canola oil is hot, add a ladle (about 1/3 cup) pancake batter. Cook until bubbles form on the top, about 1 minute. Flip the pancake and cook for an additional 30 seconds to a minute. Continue cooking the pancakes, adding an additional swirl of canola oil in between batches, until all the batter is gone. 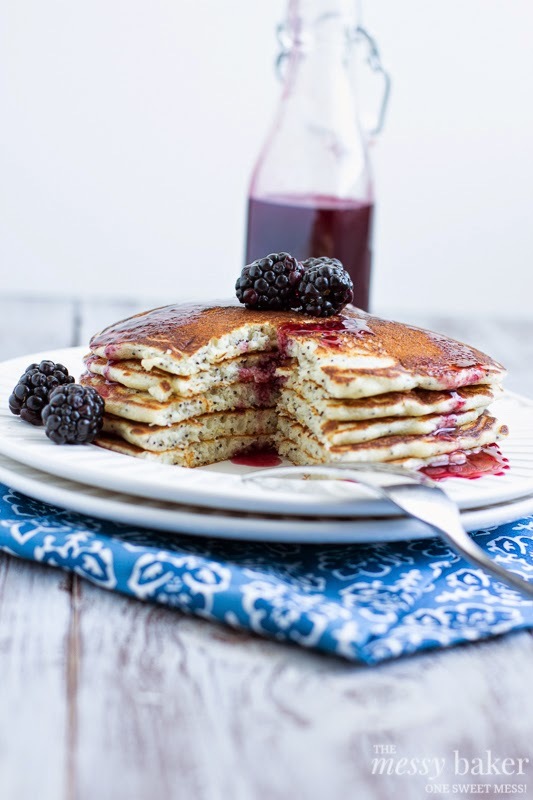 Drizzle with blackberry maple syrup (recipe below). Add the blackberries, maple syrup, water, and cornstarch to a saucepan. Whisk to combine. Bring the mixture to a simmer over medium-low heat. Mash the berries using a fork or potato masher, and then bring the mixture to a gentle boil, allowing the cornstarch to thicken the mixture. Once the mixture thickens, take it off the heat and allow the mixture to come to room temperature. Strain the syrup through a mesh sieve and store in the refrigerator until you’re ready to serve. Heat in the microwave for 30 seconds before drizzling over your hotcakes. 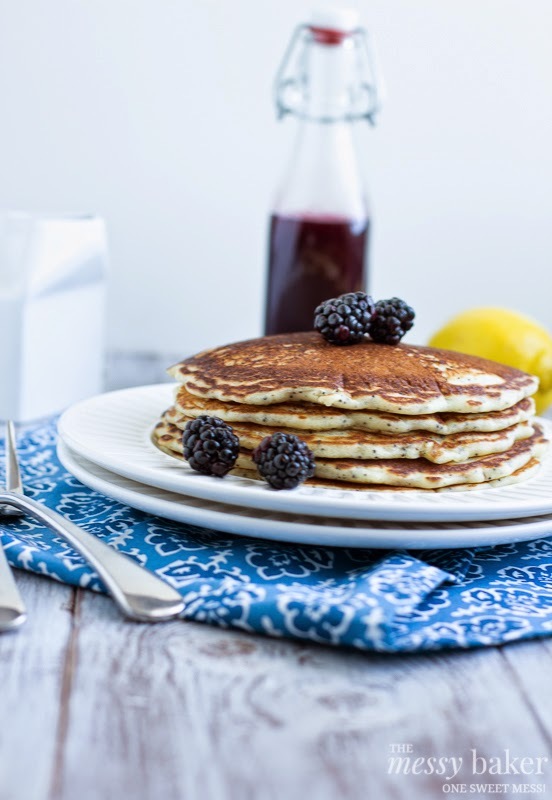 GORGEOUS pancakes! I agree-crisp on the outside and fluffy on the inside all the way! Thank you so much Jennie! Why aren't you stalking The Messy Baker yet!!? DO IT!